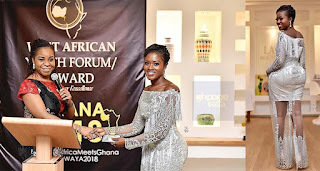 Yolo Actress Fella Makafui showed up for the 2018 VGMAs in a simple but yet classic dress. The young actress who was recently featured in a movie with Mercy Johnson titled ‘Once Upon A Family’ made a bold statement on the red carpet of the VGMAs in her glittering yellow dress. The dress which was designed by Modabertha has some feathers and crystals making her dress sparkle on the night. It is estimated that the dress cost Ghc1,000 and looking at the businesses the actress owns, it’s affordable to her, as she wanted to have a unique look at the VGMAs. It seems the actress will not stop appearing at events dressed in expensive dresses. The latest one we spotted was the all white/lace dress worn to the West African Youth Forum/Awards which was held over the weekend at the La Villa Boutique Hotel where she won the Best Actress Of The Year.